Piksel customer Channel 4 recently spoke candidly on their success with multi screen monetization and engagement. Joining Kevin Gallagher from Channel 4 on the 60-minute webcast was Piksel's Daniel Thunberg, Richard Broughton from IHS Technology, and John Moulding from Videonet. You can listen to the full recording, read Videonet's coverage of the discussion below, or do both! This article is published with permission from the author and originally appeared on Videonet, June 26th, 2014. Overall viewing of the Channel 4 portfolio of linear content is roughly the same today as it was before the launch of its 4oD on-demand multiscreen service towards the end of 2006, which means that up to now, all multiscreen viewing is additive. This was one of the opening observations from Kevin Gallagher, Chief Information Officer at the UK commercial broadcaster during a Videonet webcast about how to increase engagement and monetisation for content owner multiscreen services. You can access the 4oD service on a wide range of devices from phones and tablets to game consoles and also via Hybrid Broadcast Broadband set-top boxes like YouView (DTT) and Freetime (satellite) and the Sky and Virgin Media Pay TV services. 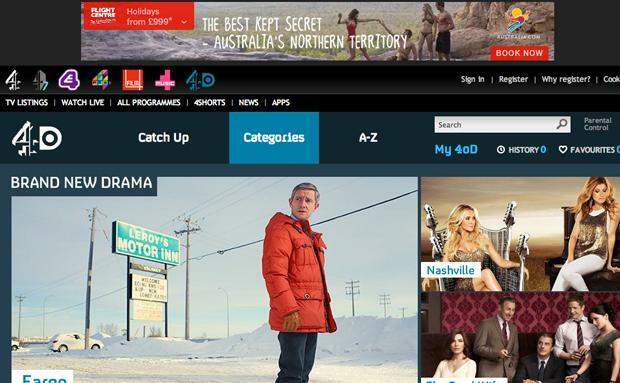 In the case of the Pay TV operators, Channel 4 delivers its content and metadata to them to manage. Most 4oD viewing is via Wi-Fi, one-quarter of it is still through a browser rather than an app, mobile apps (tablets and phones) make up another quarter of viewing (approximately) and the Pay TV services account for one-third of views. The proportion of people watching through game consoles is declining, Gallagher reported. Although downloads are becoming more popular (only available on mobile), most 4oD viewing remains on-demand streaming. Linear streaming (only available on the web product) works for some shows, like Made in Chelsea (the reality show about ‘socially elite’ 20-somethings). During the live webcast, Richard Broughton, Director, Broadband at the research and consulting firm IHS Technology said that across the television market generally, the business rationale for content owner multiscreen services is still partly defensive. “In the last couple of years we have started registering consistent year-on-year declines in broadcast viewing at market levels, in the U.S., UK and parts of Scandinavia, and that is beginning to reflect audience losses to non-linear and non-broadcast viewing mechanisms,” he declared. “We are still at the start of that trend. As it continues it becomes imperative that you capture some of that audience to ensure that the breadth of demographics and the breadth of audiences, which is reflected in the premiums that major channel groups charge [advertisers] is maintained. So part of the reason for multiscreen TV is defensive. “But this is partly an opportunity as well. It is not just about fighting a rearguard action. Your online service provides a chance to connect viewers to shows that they missed first time around, like shows with critical acclaim that missed out on big audiences, for whatever reason. Mad Men is a good example: It received great critical acclaim but average viewers per episode during the first season in the U.S. was 0.9 million. By season five that increased to 2.7 million. The webcast looked at how content owners can increase consumer engagement with a multiscreen TV service and monetise their attention better, and you can listen to the full one-hour discussion here (it is free). Broughton pointed to one simple but effective way to increase viewing that is possible without recommendation engines or even an understanding of who your viewer is: cue up the next show in a series so people can watch it as soon as they finish the current episode. “Netflix is known for binge consumption and it is very easy to watch an entire series over a weekend or less,” he noted, pointing to the way they offer your next viewing session instantly. YouTube is another service that makes good use of this feature. “The average YouTube viewer watches around 150 videos each month. The videos may only be an average of 2.5 minutes long but this figure still illustrates the ability of a platform to help you find something else that is worth watching. Those 150 videos add up to six hours viewing. Channel 4’s 4oD service already includes the ‘Watch Next’ feature, which provides algorithmic recommendations to a viewer about what they could watch next. If viewers are one of the 10+ million registered users to the service, meaning they have signed up and given basic personal details (name, email address, date of birth, gender and optionally, their postcode) and they are logged in, these Watch Next recommendations go far beyond suggesting programmes of similar genre but take into account what else you have been watching. This makes the recommendations more relevant but importantly, it also avoids recommending content you have already seen. “The key word is relevance. The system does not necessarily show the next episode in the series but it shows something we think is relevant and that will encourage people to watch more of,” Gallagher explained. He noted that Channel 4 is much more likely to ‘convert’ a viewer (into another programme start) if they are a registered user because the recommendations are much more likely to be relevant. Later in the webcast, Gallagher goes on to explain how greater relevance and online premieres, among other things, are used as incentives to 4oD users to become registered users. The broadcaster has persuaded 10 million viewers to sign up in the space of three years and can now boast that half of all 16-24 year-olds in the UK are registered 4oD users. In the discussion he provides more information about the role of online premieres and exclusives in generating buzz and rewarding viewer loyalty, outlines the 4oD viewer data strategy, discusses the role of targeted advertising and the attitude of the advertising industry to targeting, and talks about the results of Channel 4’s VOD targeted advertising trials. Daniel Thunberg, SVP, Commercial at the multiscreen and second screen solutions provider Piksel (which lists Channel 4 among its customers) was also on the panel, which focuses in some detail on how to engage consumers more deeply and monetisation strategies, including the potential for direct revenues as well as advertising.